Having been dropped off by one of our London chauffeur cars at the pickup drop off point near the Tesco’s express. I am now standing outside the O2 Arena formally known as the Millennium Dome. Designed by the esteemed British architect Richard Rogers and finished in June 1999 for the Millennium celebrations of 2000 at a cost of £700m. The Dome is a very large white tent structure which stands 52m high, is 365 metres in circumference and held up by 12 distinctive yellow posts. After the millennium celebrations the Dome was intended to be used for other exhibitions, but the company responsible for running it at the time fell into financial difficulties. Then in 2007 AEG (a leading sports and entertainment company) took over the Dome. 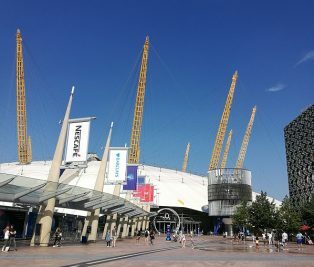 The Dome is known as the O2 Arena because of a banding partnership the telephone company Telefonica O2’s owners have with AEG. While we are outside the arena a few things of note are the Emirate Air Line, a cable car that starts from the Greenwich Peninsula and transverses the River Thames to the Royal Docks and vise versa. Also there is the very stylish 453 room Intercontinental O2 Hotel. Not for you…. Let’s go inside then… As we enter the main entrance area we have the box office and merchandise kiosks to our left and to our right the Avenue. Where we are spoilt for choice for places to eat anything from snacks to a three course dinner. Also off the Avenue you will find Cineworld an 11 screen cinema complex and the Hollywood Bowl a twelve lane bowling alley. The main attraction tho is the 20,000 seat capacity arena situated in the middle of the dome which has become very popular for holding both sporting and musical events. It has the feeling of a mini Nou Camp Stadium with its steeply raked tiered sides all the way up to the canopy above. Now till my next post it’s time for me to head back out of the dome to the pickup up and drop off point near the Tesco’s Express to meet my London chauffeur cars driver…..